Another day, another earthquake. A few days ago--11 May--there was a 5.3 earthquake in Lorca, Spain; ten reported casualties, scores injured. Let's rewind: on 22 February 2011, 181 people died in a frightening 6.3 earthquake that upended Canterbury region of Christchurch, New Zealand. Less than a month later--on 11 March--Japan was rocked not only by a devastating 9.0 earthquake--the most powerful earthquake to ever hit Japan--but a deadly tsunami that fractured a nuclear facility and claimed the lives of almost 15,000 people. Five days later, on 16 March, Chile was rocked by a 5.3 tremor. Last year, on 10 January 2010, an earthquake leveled most of Haiti with almost 500,000 deaths. In April, 327 tornadoes tore through the Southeast, claiming almost 400 lives; the National Oceanic and Atmospheric Association (NOAA) estimates that since the start of 2011, the U.S. has been hit with 881 twisters, the deadliest outbreak in U.S. history. On Tuesday, 10 May 2011, parts of Memphis, Tenn., was submerged underwater, as the swollen banks of the Mississippi River flooded that city. Yesterday--12 May--Mount Etna erupted in Italy, painting the nighttime Sicilian skyline in spectacular fiery orange hues of lava and ash. How about the baffling reports of dead birds falling out of the sky, and millions of fish washing up on shores across the globe? 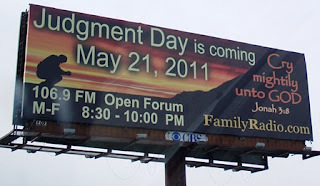 There is a Christian broadcaster named Harold Camping, who has done a series of mathematical calculations tied to the books in the Bible, along with the Hebrew calendars, and he believes that Judgement Day will commence on 21 May 2011. That's right; next Saturday. Of course, Camping has been written off as another nutcase and religious huckster, who in fact, predicted that the world would end back on 7 September 1994. So much for that prediction. Despite all of this, I have to say, Harold Camping is a very competent and faithful Bible teacher. I know this, because I have listened to many of his Bible studies, and he always says, "Don't trust me; trust the Bible." I have learned a lot as I listen to the ministry of Family Radio, but as Camping has correctly stated, I don't trust him, or any other Bible teacher. Or any minister. Let me say this; I am a flawed, screwed up guy; pride, adultery, anger, etc. An anxious glutton standing in line at life's transgressive buffet. I have absolutely no desire to judge others, except main man staring me back in the mirror. Which is why I need JESUS CHRIST as my LORD and SAVIOR. I trust GOD and the Bible alone. Period. I believe the Bible is the only way to study GOD's WORD. I take no man's word as gospel. Like the Bereans in Acts 17:10-11, who "searched the scriptures daily, whether those things were so...", I want to read the Bible for myself, study the Bible for myself, and pray and ask GOD for HIS Saving Grace, Guidance, Mercy and Wisdom to understand what I am reading. As I compare scriptures with other scriptures, and I am always blown away by the absolute cohesiveness of the Bible--both Old and New Testament--and how it all holds together. It is amazing, breathtaking, and liberating, to say the least. I left the church almost ten years ago, because I didn't feel I was getting the full impact and exegesis--that complete interpretation--of Scripture. Though I gleaned much insight at the church I attended (a great Christian ministry, with folks I love dearly), I truly believe GOD has revealed a lot more to me in HIS Word in the last decade, via prayerful and careful study, and the use of the Strong's Exhaustive Concordance, which translates each word in the Bible from the original Hebrew, Greek, and Aramaic text. "Take ye heed, watch and pray: for ye know not when the time is. For as a snare shall it come on all them that dwell on the face of the whole earth. Watch ye therefore, and pray always, that ye may be accounted worthy to escape all these things that shall come to pass, and to stand before the Son of man." Therefore let us not sleep, as do others; but let us watch and be sober." "Be watchful, and strengthen the things which remain, that are ready to die: for I have not found thy works perfect before God. Remember therefore how thou hast received and heard, and hold fast, and repent. If therefore thou shalt not watch, I will come on thee as a thief, and thou shalt not know what hour I will come upon thee." The word watch is a constant theme through those Biblical passages, and it's a word that GOD does not want us to ignore. Therefore I'm beginning to believe that the calculations leading to 21 May 2011 are very accurate. In the meantime--LORD Willing--I'm going to love GOD, my family, my heart, and my friends, post on Hooked on the American Dream, monitor the Cirque Du Foole'-- a.k.a., politics--and global events on MSNBC, CNN, NY Times, Wash Po, BBC News, and Reuters, watch my favorite films and documentaries, wondering if Hip Hop has reached it's own fin de siecle, and thinking up ideas for essays, docs, scripted television, novels, and indie films. However, my priority is to continue to be steadfast in my watching, reading and studying the Bible, and most importantly, I will be praying to GOD to have mercy on a rotten sinner like me. I do believe all of these disasters is GOD warning all of us that HE Is on HIS Way. Whatever happens on 21 May 2011 is GOD's Will, and a monumental reminder to me of this one fact; this world is not going to last forever.